In accordance with the Olympic Regulations (Art. 41), diplomas were prepared for awarding to winners and those who had reached the prescribed places of honour in both individual and team events. The diplomas were made out in Italian. They measured 62 X 47 cms. and were signed by both the President of the I.O.C. and by the President of the Organizing Committee. 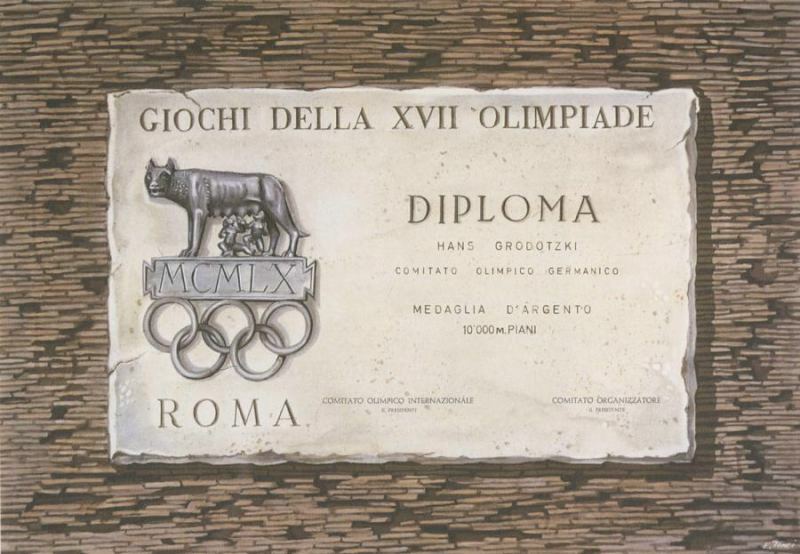 In all, 1,801 diplomas were issued which included those issued to the Olympic Committees of countries whose athletes had won a medal in the course of the competitions. Furthermore, special diplomas of merit, signed by the President of the Organizing Committee and the President of the Executive Committee, were issued to persons and institutions which, under various forms, had contributed to the various sectors of the Organization. 5,800 of these were issued.